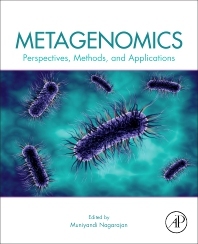 Metagenomics: Perspectives, Methods, and Applications provides thorough coverage of the growing field of metagenomics. A diverse range of chapters from international experts offer an introduction to the field and examine methods for metagenomic analysis of microbiota, metagenomic computational tools, and recent metagenomic studies in various environments. The emphasis on application makes this text particularly useful for applied researchers, practitioners, clinicians and students seeking to employ metagenomic approaches to advance knowledge in the biomedical and life sciences. Case-study based application chapters examine topics ranging from viral metagenome profiling, metagenomics in oral disease and health, metagenomic insights into the human gut microbiome and metabolic syndromes, and more. Additionally, perspectives on future potential at the end of each chapter provoke new thought and motivations for continued study in this exciting and fruitful research area. 13. Metagenomics of Marine Invertebrate-Microbial Consortium. Dr. M. Nagarajan received his M.Sc and PhD in Environmental Biotechnology from Manonmaniam Sundaranar University, Tirunelveli, Tamil Nadu, India. After his Ph.D program, he carried out his postdoctoral research at Centre for Cellular and Molecular Biology (CCMB), Hyderabad, India and then at Laboratoire de Biologie Moléculaire de la Cellule, Ecole Normale Supérieure de Lyon, France. He was an Assistant Professor at Sri Paramakalyani Centre for Environmental Sciences, Manonmaniam Sundaranar University, Alwarkurichi, Tamil Nadu before joining Central University of Kerala in 2012. He is an editorial board member of Webmed Central Plus Genetics and reviewer of many peer-reviewed journals in the field of Genetics and Genomics including Gene and Biochemical Genetics. He has 18 publications in leading international journals including PLoS Genetics and Molecular Ecology. He has been awarded the Fast Track Young Scientists award by DST, Govt. of India. Presently, he is operating two major research projects funded by UGC and DST.